When you throw a party, you settle for nothing less than the best. No matter if it’s a community festival, an after-prom party, a fundraiser, or a corporate event, if you’re the one helping to plan it, then there will be absolutely no yawning, only smiles and laughter. You’re a party expert, and you want to know that the company you hire to provide the party supplies has the same level of commitment as you do. Fear not! At Celebration Source, we’re dedicated to being Southeast Florida’s premier party rental service provider. We don’t cut any corners and we always strive to exceed our customers’ expectations. 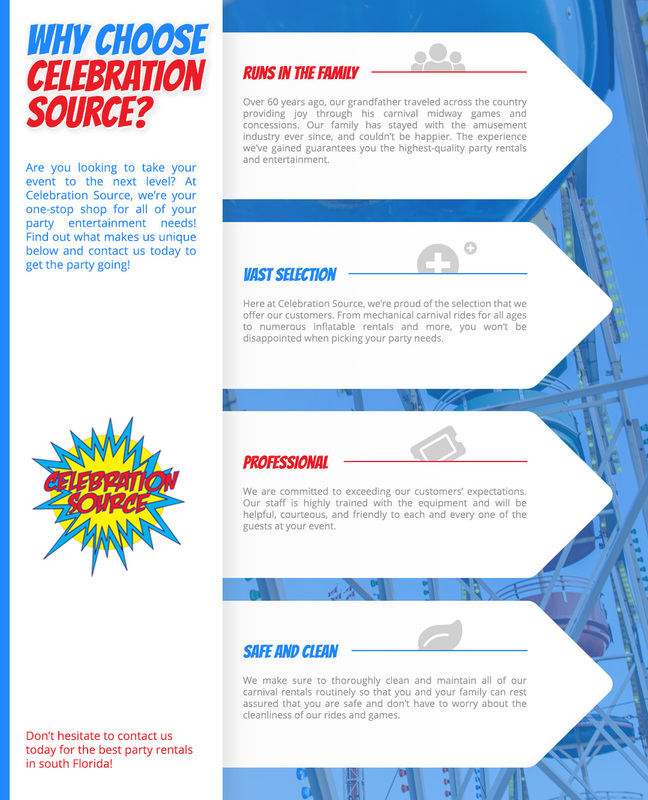 We understand that you have a few options when it comes to hiring a company, so if you’re currently trying to make a decision on who to go for, read this blog to find out why Celebration Source is the obvious choice. If you would like more information then go ahead and contact us now, or request a free quote! No other company in Florida has as much experience in party entertainment services than we do. Our family got into the industry over 60 years ago when our grandfather began providing carnival midway games and concessions, and generation after generation has followed in his footsteps. While, originally, we travelled along the east coast, there was something special about Southern Florida so we decided to make the area our perpetual home. Over the years, you could say we learned a thing or two about party planning and rentals, and are considered experts in the industry. Whether you’re throwing a massive event for the entire community or a small birthday party for your child, we’ve got what you need to take the event to the next level. We’ve accrued a vast collection of party supplies and rentals to help you have the party of the year. 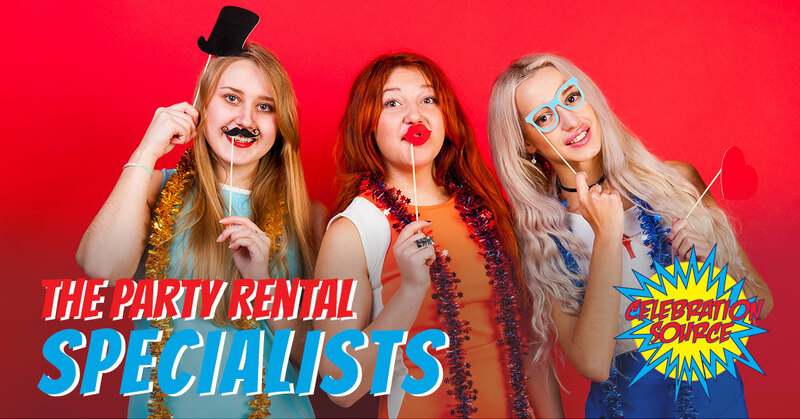 From mechanical rides, bounce house rentals, and carnival games to party entertainers, carnival food, photo booths, and more, the only trouble you’ll have is deciding on the right party rentals for your event. Along with customer satisfaction, the safety of the event’s attendants and the cleanliness of our rentals are top priorities. We make sure that every single one of our rides and rentals are routinely maintenanced and cleaned so you can rest assured that you and your loved ones are safe and don’t have to be concerned about the cleanliness of the attractions and games. Each member of our staff is professionally trained and knows our equipment and rentals backwards and forwards and are dedicated to your satisfaction. From the moment we arrive to set-up the fun to the clean-up after the event, you can count on our staff to be friendly, courteous, and professional. Celebration Source is a one-stop shop for all of your party entertainment needs! We’re ready to help you throw an unforgettable event that is guaranteed to have every one of your guests smiling the entire time. 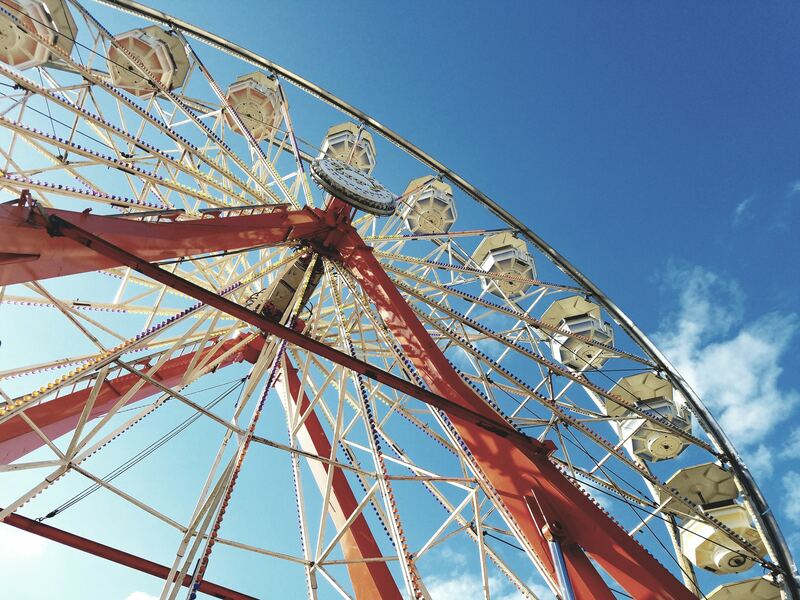 To learn more about our carnival rentals and the services that we offer, don’t hesitate to contact us today!